If you have a tall, curvy body, the right pair of women's tall plus-size jeans are a wardrobe staple. A good pair of jeans can be dressed up or down, providing that they fit you the way they should. Shop at any of these retailers to find tall, plus-size jeans to flatter your figure. While it may seem as though stores tend to carry either tall or plus-size jeans, there are a few different companies and brands that carry jeans that fit long-legged curvy women. Shop at one of these locations to find the jeans you're looking for. Navy Butter Denim Bootcut Jean - This style sits at the waist and is fitted through the hip and thigh, but flares out slightly from knee to hem, which makes them a good choice for wearing with a pair of ankle boots. The jeans are made from a cotton/poly/spandex blend, so they'll have more stretch and much more softness to them than a pair of all cotton jeans. They come in sizes 14 to 26 with an inseam of 35 inches for the tall length, and they retail for about $60. Delux Stretch Straight Leg Jean - These jeans come in a go-anywhere medium wash. They have a fitted, straight leg and sit at the natural waist, so they may fit better on women who carry their weight evenly, rather than the hips and thighs. The pants are made of a cotton/poly/spandex blend that has quite a bit of stretch for added comfort. They come in sizes 14 to 32 with an inseam of 35 inches for the tall length and retail for close to $50. Bootcut Jean with T3 Tighter Tummy Technology - These stretchy jeans are made of a cotton and Spandex blend that offers a bit of stretch, but they hold their shape well. They have a somewhat higher rise with a hidden elastic waistband to offer more support for your lower tummy. They come in a dark wash in sizes up to 28 with a 35½-inch inseam and retail for about $80. 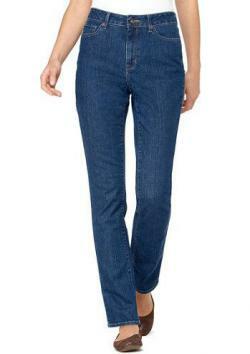 True Shape Slim Leg Jean - These jeans sit at the waist and are fitted through the hips and thighs. Pair them with a tunic or long sweater, or tuck them into a pair of boots to dress them up. The True Shape technology guarantees the jeans will hold their shape while you wear them and won't sag. They come in a medium, dark, or black rinse in sizes up to 20 with a 32-inch or 34-inch inseam and retail for nearly $60. 1912 Straight Leg Jean - These jeans come in L.L. Bean's "favorite fit," which sits just below the waist and is slightly fitted through the hips and thighs. The jeans are straight from the knee to the hem and are made from hand-sanded denim with a hint of spandex for superior fit and comfort. They are available in four washes up to size 20 with a 32-inch inseam. They retail for about $60. True Shape Favorite Fit Bootcut Jean - Sitting below the waist and fitted through the hips and thighs, these bootcut jeans are made of high-tech stretch denim that won't become baggy throughout the day. They're a good fit for women who carry their weight evenly. They have a flattering bootcut, perfect for wearing with fitted boots. They come in three rinses in sizes up to 20 with a 32-inch inseam for medium-tall and 34-inch inseam for tall. These jeans are priced around $60. While it may feel as though it's difficult to find jeans in your size, there are options out there if you know where to look. Shop any of these retailers for plus-size, tall-length jeans and find some flattering jeans that fit your shape.